How do I use FeedDemon's content filters? The Content Filters in FeedDemon Pro are designed to hide the stuff you don't care about. Instead of seeing every single article in every single feed, you can have a content filter which automatically hides articles that don't interest you. For example, suppose you're subscribed to several high-traffic tech feeds which talk about a lot different things, but you only care to see articles about Google, Apple or Microsoft. 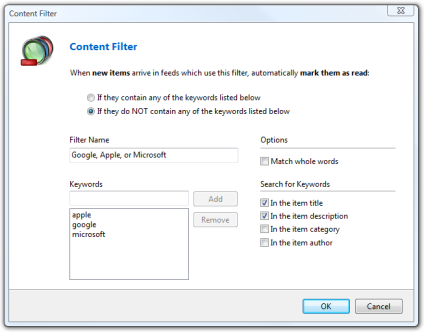 Simply create a content filter which has Google, Apple and Microsoft as the keywords, then choose the option to mark articles as read if they do NOT contain any of these keywords. Next, save the filter, then choose Tools > Manage Content Filters and assign your new filter to those tech feeds. From now on, articles in those feeds which don't mention Google, Apple or Microsoft will be marked as read before you see them, hiding them from view. Note that to avoid confusion, a feed can have only one content filter. It's not possible to assign multiple content filters to the same feed. Tip: If you subscribe to a feed which has several different authors, you can use a content filter to show or hide articles from specific authors.